Low-self discharge 9v Ni-MH batteries have become available in the last few years. The “low-self discharge” label means these batteries will hold their charge for a year, unlike previous NiMH batteries. This makes these 9V battery much more compelling, because 9V batteries are often used in applications like fire alarms, where the battery must sit for year or more. Accupower has released a 300 mAh 9 Volt Rechargeable NiMH Battery — this currently the highest capacity rechargeable 9V. You can find the low-discharge, 200 mAh “Centura” Tenergy 9V rechargeable battery, on Amazon, $26 for a pack of 4, including a charger. The 250 mAh 9V Imedion by Maha is available on Amazon for $20.95 for a pack of 2 batteries. These batteries are more expensive, but they have a higher capacity of charge (250 mAH compared to Tenergy’s 200 mAh), and Maha’s batteries have a better reputation in terms of quality. You can also get Lithium Polymer 9v rechargeable batteries, that use a new gel-type electrolyte. This gel has an energy density that is 20% more than typical lithium ion batteries (550 mAh in capacity). They also last 2 to 3 times longer than rechargeable 9V NiMH batteries, and they hold their charge longer. See also our review of this year’s best rechargeable AA NiHM batteries and chargers. There are now some Li-ion rechargeable PP3’s alleged to hold 900mAh, made by Etinesan. Does anyone have any test results to prove or deny the claim? I’m going to look at a couple of those, but I don’t have great expectations for them. I’ve bought 10 of the EBL 600 mAh batteries too, those look like being a much better deal, but I’m not sure whether the voltage will be good enough. About that battery voltage in general, is there consistency for Li-ion in PP3 format? Most people suggest two cells, only 7.4V, but I have seen a picture of a Saft pp3 that clearly has three very obvious bulges, cylinders that lie across the width of the battery, so assuming 3.6V cells instead of 3.7, gives 10.8V, a little about that of a very fresh Duracell. Three cells would give a much better voltage to mimic a good quality new PP3 alkaline cell, so if Saft do this (and Saft have been making batteries for decades, and usually of types that become major standards taken up by most other firms years after Saft got there), why would two cells be a standard? Where do I purchase 9V rechargeable batteries and a charger. I have a tens unit. Which charger & battery do you suggest. The Etisan 600 mAh Li-ion batteries are poorly constructed and most fell apart after using them a few times. I have one that continues to work… but it does not hold as much charge as the EBL. The Etisan is also on the large side and doesn’t want to fit into the 9V battery space in some devices. I doubt that the 900 mAh they advertise will provide 900 mAh. Perhaps it will do 600 mAh? What good is it if it falls apart? They have some kind of circuitry under the top to stop the battery from overcharging or charging too quickly. Perhaps that is responsible for it being a bit oversized? I’m very happy with the EBL. P.S. I haven’t found a good charger for Li-ion batteries. All my normal chargers do a poor job. I’d rather charge slowly than quickly but can’t find a good Li-ion slow charger. They all seem to be quick chargers. What are the best rechargeable batteries for a tens unit ? I have a broken back an MS set up pain is imense so wear it all the time . when was the page originally wrote or when was it updated? if im trying to find the best high output 9v, if im understanding correctly- im lead to believe the best solution is a 9.6 low discharge. would i also need to make sure my charger can bring that much intelligence? here is my charger and I was considering these batteries also- which in the reviews (some old) say that its a 9.6.
those are generic observations- can you teach me how to dougie please? Can you charge these EBL Lithium Polymer Batteries in a charger designed for NiMH batteries? So, which of these ‘9 volt’ rechargeable batteries actually produces 9 volts? My understanding is the Li-Ion are simply two 3.7 volts cells in series, so that would be only 7.4 volts. A 7 cel NiMH would be 7 x 1.2 volts per cel = 8.4 volts. So that would leave 8 cel NiMH batteries at 9.6 volts. 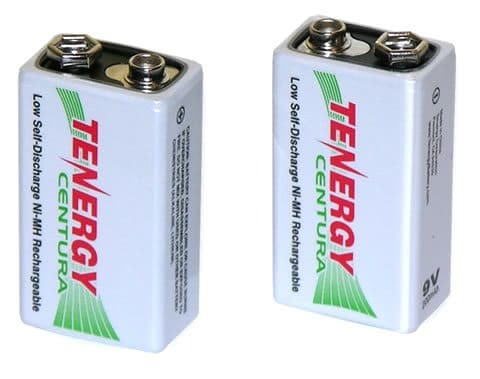 Are the Tenergy Centura or any other make & model 8 cel units? Do these have AAAA cells inside? Some do, but others use cells that looks like tiny Altoids tins. No, neither. I had the fusible link in one fail after an (extended) accidental short, so I opened it up. It contained 7x 1/3 AAAs securely welded in series inside in a honey-comb-soap-bar type carrier. Unfortunately, the individual 1/3 AAA cells had no heat shrink over them, so it is more difficult to put the salvaged cells to good use. But, these 9V batteries are excellent, and out perform many competitive batteries that claim more capacity. Imedion makes two types of low-discharge 9V NiMH rechargeable. One is a 7 cell (250mAh), the other is an 8 cell (230mAh). Besides NiMH type,CR type,primary 9V battery, there is also some lithium polymer type 9V battery, but in fact they are 7.4V, I don’t know how it can be used as 9V application, compared to this type, personally I think LiFePO4 type is better with longer cycle life and higher voltage 9.6V, however, its shortcoming is lower capacity. It’s true that no one is perfect, indeed. I use tons of 9v batteries for guitars and belt packs (I am a professional musician). The guitars especially are very low draw devices with time where they sit in storage. Being new to the rechargable game, does anyone have recommendations on what batteries to get? I would rather have quality, durability, and charge capacity over price point. A lot of these batteries are quite useful for an integrated source for a headphone amp. I have a standard 170 from duracell, and I’m constantly running out withing 40-50 hours with 2 of them. Great little accessories if you are traveling and don’t want to lug around your headphone amp. can you run these through a adjustable regulator to work at 3.7-5v? Just curious, I’m a noobie and want 3.7 through 5v but not run 2 rechargable batteries in a series. These are a series of many small cells, and are not high enough drain or capacity for vaping. You’d be significantly safer with two IMR 18650 or 26650 cells in series. You could also use a buck converter to boost voltage from a 3.7 source. I’m curious about their effectiveness in smoke/carbon monoxide detectors. Those give warnings to change batteries when the battery drops to 7-7.5 volts, which gives them a 30 day lifespan from that point where they’ll beep constantly. For alkaline batteries this is measured almost exactly, but with rechargeables having a longer plateau of voltage before a steeper drop, would these batteries be able to provide the manufacturer’s “minimum safety requirement” for batteries of that 30 day warning time from when it hits 7 volts? If you’re interested, check out my new website at http://www.batteryblaster.com. How do these compare to the 9.6Volt NiMh batteries as far as nominal voltage under load? I use mine for in ear monitors and lower voltage batteries causes it to think the voltage is too low and the sound drops out and the low voltage light starts blinking. I know Lithium hold their voltage very well, but I don’t know if its enough to compare to the higher 9.6V. Nominal Volts of 8.4 of the Lithium is a whole volt lower than the 9.6 Volt of the NiMh.. but I don’t know if “nominal voltage” is that different. Can you help me in my quest? I would also like to know this! How is the nominal voltage on the maximal power lithium ion batteries?? I own the 500mAh I-Power and they are worth their weight in gold I have had mine for over a year. I use them every day in a portable scale to do inverntory for restaurants 6 days a week and they last about three times as long as a reqular 9-volt and twice as long as a stantard NiMH. P.S. Leave the charge at home I have forgot mine at an account and it was gone the next day. Lithium polymer batteries hold their charge longer than NiMH batteries. Not sure of the exact specs…. Do these batteries hold charge well? The smoke alarms in my house use 9V as backup to the mains. They are low self-discharge, so they hold 80% charge for year at least. Virtually every electric guitar effects box uses 9v. Karl, you’re right. I forgot about all the Fluke DVM’v and cable testers we have. They’re all 9v. I’m thinking about getting these for work (community college). We have 3 wireless mics for our auditorium and almost all of our smoke alarms and other sensors use 9v batteries. Be nice to have a rechargeable that doesn’t drain down when not in use, recharges more times than NiMH, and doesn’t contain any heavy metals. But what do people use 9 volt batteries for these days? I’m sure many toys still require 9V batteries but as an adult there are also many applications for 9V batteries, clock radio back-up, all forms of smoke detectors, radon & Co2 detectors, stud finders, telephony toners, both toner and wand. There’s plenty of things out there, just because you don’t use them doesn’t mean someone else doesn’t. I use 9 volt both for the electrics in my acoustic guitar as well as my smoke detector. my guitar takes alkaline 9 volts can I use lithium ion instead? a GUITARIST OR MUSICIAN on stage can easily be burning through 3-6, Possibly many more…. 9v. depending on how much wireless gear they have. Almost all musicians will have a few 9v in their gear as a backup even if they have run power chords for everything that can be corded. so, its practically impossible for a musician to get away from 9v.